Hoo boy. Before I begin, I want to make one thing clear—there’s a lot to like about Shadow of the Colossus. I recognize the artistry that went into the game, and just because I don’t like something doesn’t mean I think other people can’t enjoy it. That would be nuts. I wanted to love Shadow of the Colossus, but in the end I had a lot of problems with it and I wanted to share them with the world. This is nothing more than my review of Shadow of the Colossus with an admittedly-kinda-inflammatory headline. Okay?.. Okay. Some context, then: I've been a Nintendo lad since before I could multiply numbers. I've been a member of the PC Superior Ethnicity—or whatever it’s called—for the better part of a decade now, but my exposure to non-Nintendo home consoles has been limited. It’s because of this that I’d known for a while that Shadow of the Colossus must be one of the all-time greats; because even I had heard about it. So when I picked up my PS4 this past Black Friday, I had one game in mind: Bloodborne. But when I saw that Shadow of the Colossus was getting a PS4 remake, I was also very interested in that. Here was my chance to experience one of the classics, revamped for the current generation! The PS4 edition of Shadow of the Colossus dropped about a week or two ago, and it’s the first time in a while I've actually gone to the trouble of tracking down a game in-store to play on release day (college Wi-Fi, as many of you know, means that any full-sized game takes the better part of the Mesozoic era to install). That was how excited I was to join to Cool Kid’s Club of People Who Have Played Shadow of the Colossus. And from the outset, I thought the game would deliver. As was promised at the start, let’s take some time to go over the things that Shadow of the Colossus does well. For starters, the starter. This game has the best introduction I've ever seen in a game. The opening cut scene of our hero’s journey to the edge of the world is masterfully done. The music, the scenery, the art style, the simplicity of the world—everything comes together to immerse the player in the dreamlike, lonely atmosphere that permeates the entire experience. All these aspects of the game hold up throughout the entire experience. All the credit in the world should be given to Bluepoint Games for the work they put into updating the visuals. And to Team Ico’s credit, they got a lot of things right with the original design of the game. The unique look of the game world remains a strong point from start to finish, the music always suits the gameplay perfectly (though the repetitive nature of some of the pieces wore on me during the longer boss fights), and the atmosphere never wavers. My earlier description of the world as "dreamlike" was purposeful; the game really does give the player the sense that he or she is trapped in a dream, fighting a Sisyphean battle with only the faint breeze of the afternoon and the occasional lizard for company. In summary, the presentation is top-notch. 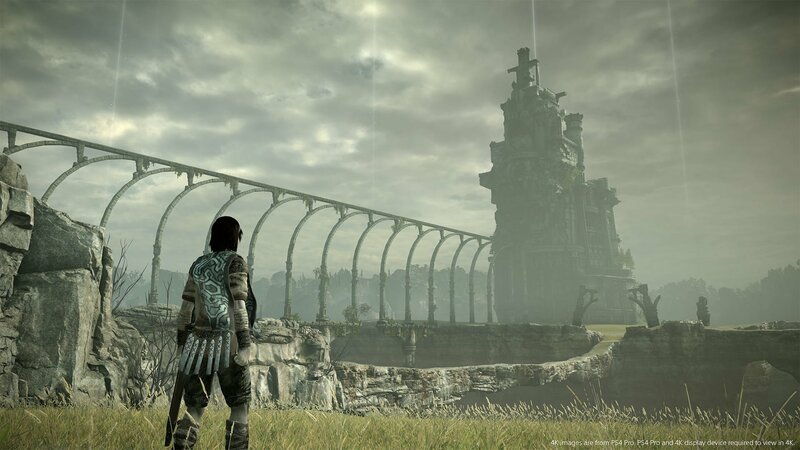 Aesthetically, Shadow of the Colossus offers an experience you won’t get anywhere else, and for that reason I can understand why the game is remembered fondly by so many. 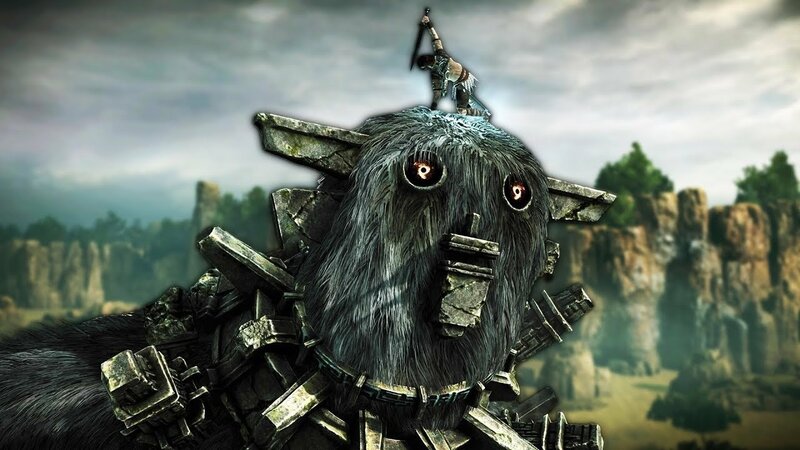 I won’t waste any more of your time talking about the things Shadow of the Colossus does well—if you’re reading this, then chances are you already know what makes Shadow of the Colossus good. I’m 13 years late to that party. You want to know why I don’t think all that very nice presentation doesn’t redeem Shadow of the Colossus as a game. So let’s talk about the gameplay. The gameplay is atrocious. It’s laughably bad for a big-budget flagship title, it’s dodgy by Steam Early Access standards, and it’s 100% unforgivable in a remake of a game that’s considered to be one of the all-time greats. All the nice presentation in the world doesn't matter when the game’s central combat mechanic borders on unplayable at times. The irony here is that while I was playing this visually unparalleled edition of the game, I spent a lot of time thinking about how I’d be more forgiving of the game’s rough edges if I were playing the original on PS2. At least then the tech limitations would be somewhat understandable - although given how famously wonky The Last Guardian’s gameplay was, I suspect that gameplay is something Team Ico haven’t ever nailed down. I honestly would've been fine with a straight port of the PS2 version’s graphics if Bluepoint had poured all that effort into fixing the game’s mechanics. At this point, I hear an argument crop up in the game's favor: the gameplay is only meant to be a vehicle for the (admittedly excellent) story and atmosphere. I've thought a lot about this point, but the more I think about it, the more it loses me. I've loved plenty of arty games with passable gameplay over the years. I think Spec Ops: The Line is relevant here: the gameplay is for the most part unremarkable and occasionally even a bit frustrating, but the story and characters drew me in effortlessly. 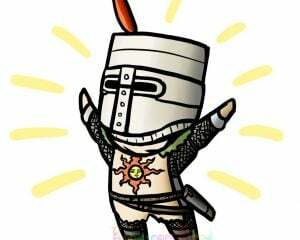 Dark Souls is one of my favorite games of this decade (aren't I special? ), but it must be said that the game’s mechanics are probably its weakest point. The combat is deep and customizable enough to keep replays interesting, but that’s not why I come back to Dark Souls. I love Dark Souls because the world is organic and detailed, and filled with characters whose motivations and goals make sense to me. I love Dark Souls because it drenches the player in the lonely atmosphere of a crumbling world. I love Dark Souls because when I play it, I feel the burden of being horribly under equipped to save the world all alone. The point I’m trying to make is that I understand games that stand up more on the strength of their story than their gameplay. But for me, what makes these games work is the fact that their gameplay is competent. Gameplay-wise, Spec Ops: The Line is just another drop in the tidal wave of third-person shooters that the early 2010s spat out, but the gameplay does its job well enough that I can enjoy the story unimpeded. Dark Souls’s hitboxes blow chunks sometimes, but the core gameplay works well enough that I don’t lose interest in seeing what else the world has to offer. I've got nothing against a game that stands out on the strength of its story, but for me, the medium simply demands that a great game must have, at least, decent gameplay. I wouldn't get as much out of Catch-22 if, for no reason, some pages of the book were printed in a font size that was painfully hard to read. A good story is a good story, but when that story goes into a specific medium it has to exist in that medium well enough to not detract from the story itself. I realize that I haven’t been talking about Shadow of the Colossus directly for the last few paragraphs, so let’s look at its gameplay a bit more closely. Like everything else in Shadow of the Colossus, the gameplay is deliberately minimalistic. You get from Point A to Point B on horseback, and you climb the colossi to stab their weak points. That’s it. Conceptually there’s nothing at all wrong with the gameplay. 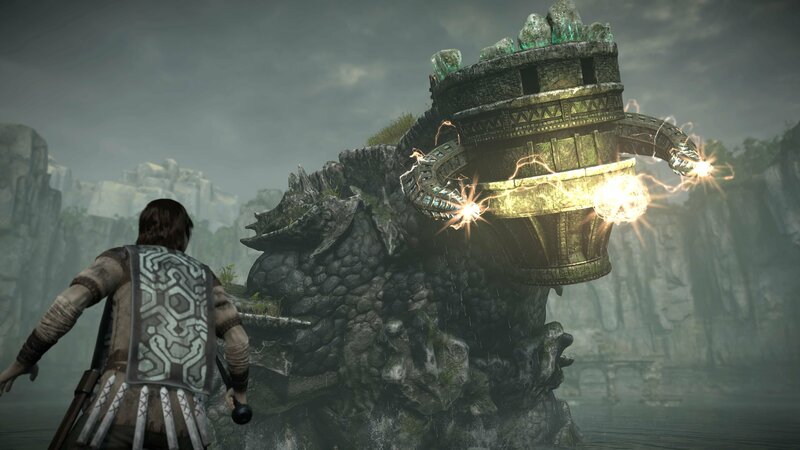 Heaven knows that plenty of games have exploration and boss fights, and stylistically it makes sense for Shadow of the Colossus to keep its gameplay simple. The problem is in the execution: your horse handles like trash and the game is very bad at judging whether or not you’re holding onto a given colossus. The camera is constantly fighting the player in both sections of the game, as it seems to be more concerned with showing off the world than it is with helping you to see where you’re going. There was one point late in the game—you’ll know what I’m talking about if you’ve played it—where the player has to go over a crumbling bridge, and I spent a solid 30 seconds glitchily falling to my death because the camera moved in such a way that I was no longer pointing my horse in the direction of safety. It also seems to be random as to whether or not your horse will understand your request to go faster, and navigating the thing around any sort of obstacle is a fool’s errand. 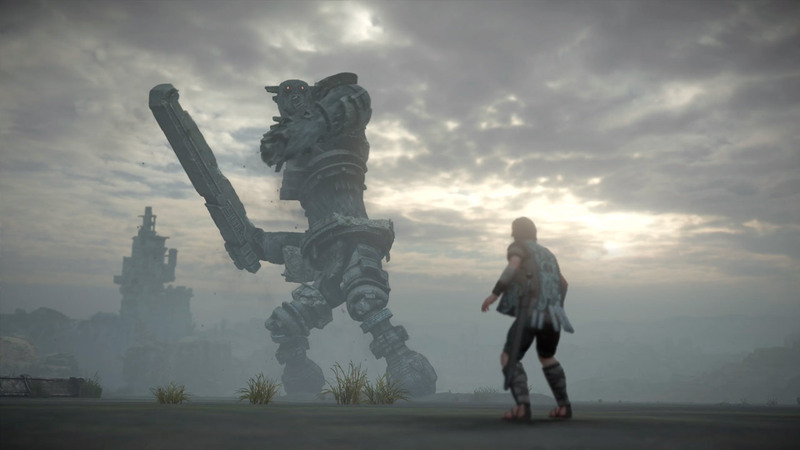 Things don’t get much better once you’re in combat, either, as the colossi have an irritating habit of shaking you off in such a way that you’re still technically holding onto them but have no choice but to drop off and start over again. As I’ve said, I’m willing to accept some bad design in a game when the gameplay works well enough overall to hold my interest. But Shadow of the Colossus has bugs and outright bad gameplay design all over. It feels like a game that was designed by a studio with dozens of brilliant artists and two or three decent programmers. The imprecision of the controls is especially unforgivable in a remastered edition, as Bluepoint could easily have spent some time smoothing out the game’s climbing mechanics and horse handling. Would anybody have complained if a little less work had gone into the game’s visuals? The game’s look is so unique and well-executed that you would have be deliberately trying to screw it up. Give me a few hours with Super Mario 64 and I’ll be too busy having fun to notice the dodgy graphics. But when a game intermittently refuses to do what it’s supposed to, that’s going to frustrate me in a way that will color my recollection of the experience as a whole. I know a lot of people love Shadow of the Colossus. If you’re a fan of the game and you've come this far, props to you for hearing me out. I recognize that there are a lot of things to like about Shadow of the Colossus. But all the things that the game does well don’t gel with my definition of what makes a good game. I don’t regret playing Shadow of the Colossus, and I’m going to remember it as a good, unique story. But I just can’t concede that it’s a good game.